In our busy lives bedroom should not be just a place to have a good night sleep. We all need a bedroom which may serve as an oasis within our homes where we can find an escape for some rest and relaxation. It takes a little work, some accessories, colour coordination, wall art, few yards of sheers and some greenery to add some style to a bedroom where one can relax and feel nice sleeping and waking up in that space. 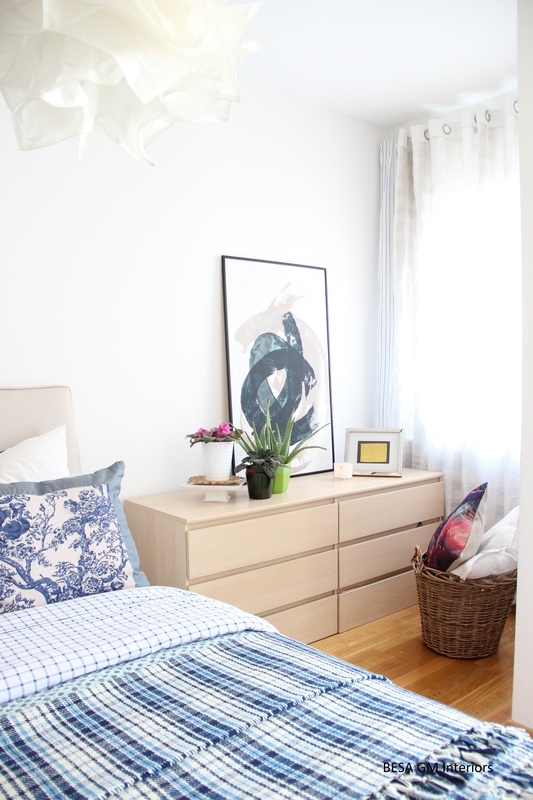 This small bedroom was turned from a very depressing and empty looking room into a decently dressed and happy space where the owner likes to wake up in the morning.All of this without spending a dime. 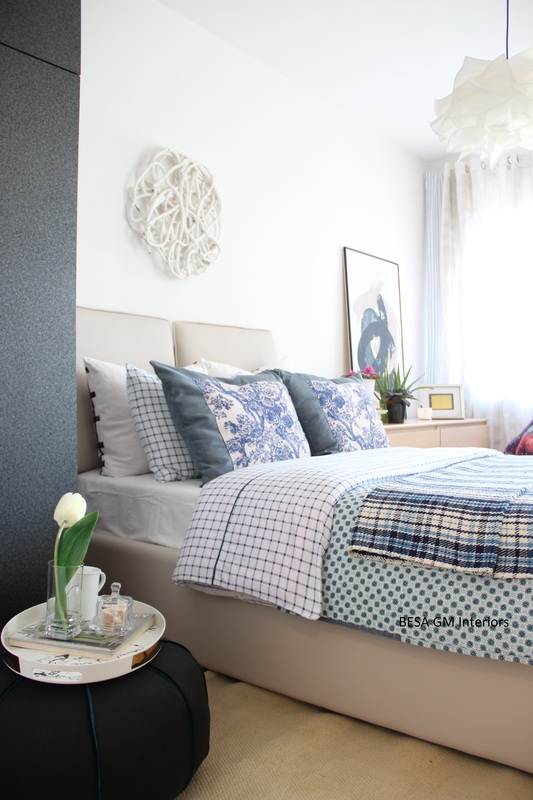 After changing the layout of the furnishings of the room and after gathering some of the accessories which we found around the house, also by using the existing duvet and pillow covers, I managed to turn this naked looking room into a space that feels bright and decently dressed in hues of blue. Mismatching patterns come together in a single color scheme to create an artsy visual. Considering the size of the room, the storage space is limited so using baskets proved to be a good idea. 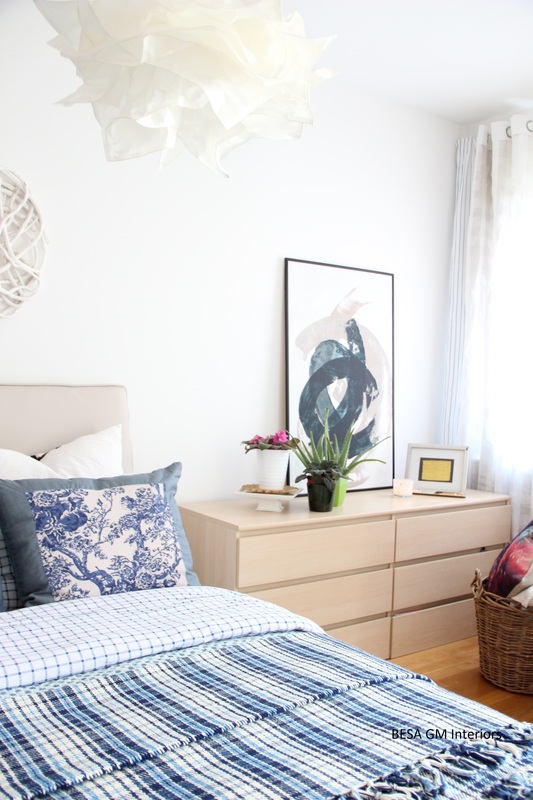 The basket serves as decor, and as storage containing extra throws and pillows. In a small bedroom there may not be a room to fit a nightstand! 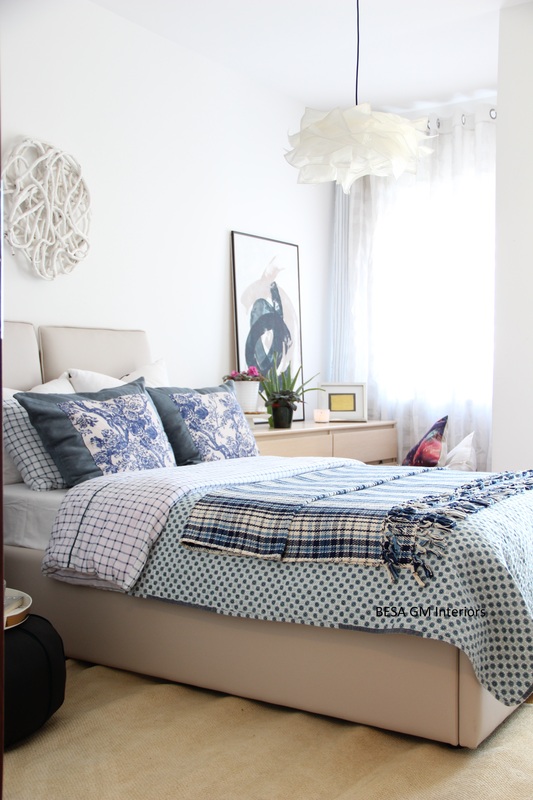 Use soft furnishings, such as a pouf that may be placed beside the bed! 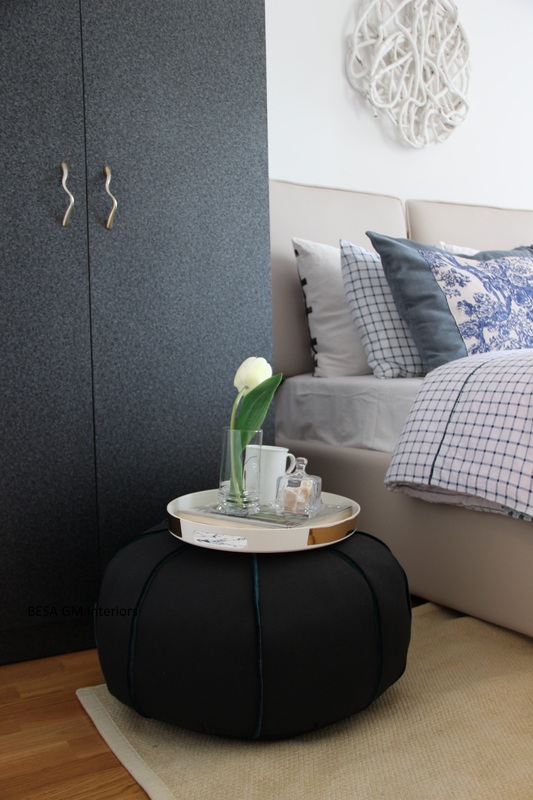 It may serve as a place to put your phone, a book or why not your favourite chocolate.You can easily shift the location of the pouf whenever you feel it is on your way, and even if you hit it while making your bed, you will not get bruised. Since the room has plenty of light, I added light curtains thus allowing the sun to shine through. Beside the decorative aspect, these light curtains opened up the room and added some character. The large dresser is also being utilised as a nightstand. In small spaces it makes sense to use a larger piece of furniture rather than a few smaller ones. The large piece of furniture that fits well in the space makes the room feel larger. The top of the dresser is accessorised with some decor pieces and greenery. The large piece of art in hues of blue above the dresser adds personality and cheers up the room. The fresh and crisp look of this room was achieved mainly using items found around the house. 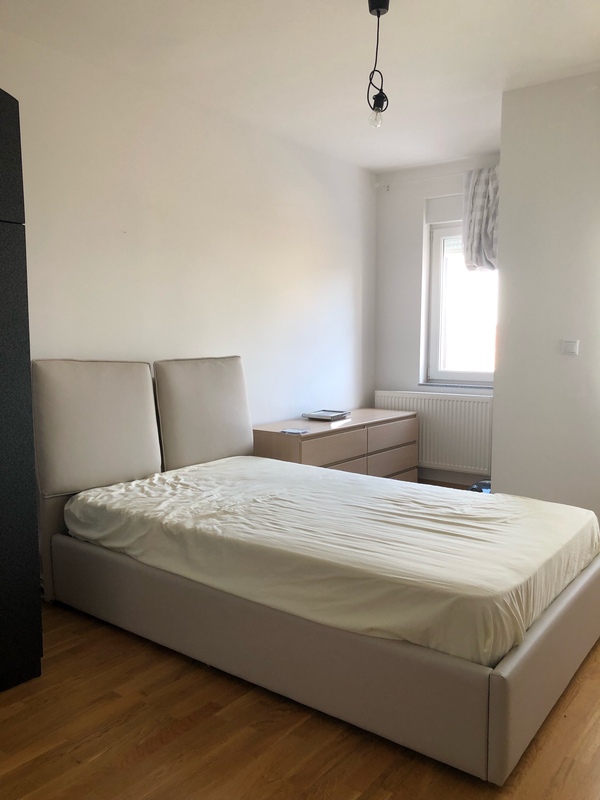 The only new item in this room is the bed and the mattress, all the rest are previously owned/used items; yet everything looks crips, fresh and cosy. This proves how impactful the styling of a room could be. Even a little bit of styling elevates a room from a naked to a decently dressed room as in the case at hand. Thank you my friend….it was indeed a super little cost project, but it turned nice and fresh looking. The light fixture is IKEA; I had bougt them in bulk in one of my trips to IKEA two years ago, and now I use them in low cost projects such as this one! Omg! I love this room! Such a great jobb. Thank you so much Merita, for checking this post and leaving a comment! The room turned out nice and crisp, and I am glad that I found time to tackle this room!